Following insertion into Mercury’s orbit on March 17, Messenger has finally sent home the first images ever recorded from within the orbit of our innermost planet. Early this morning, at 5:20 am EDT, MESSENGER captured this historic image of Mercury. This image is the first ever obtained from a spacecraft in orbit about the Solar System’s innermost planet. Over the subsequent six hours, MESSENGER acquired an additional 363 images before downlinking some of the data to Earth. The MESSENGER team is currently looking over the newly returned data, which are still continuing to come down. 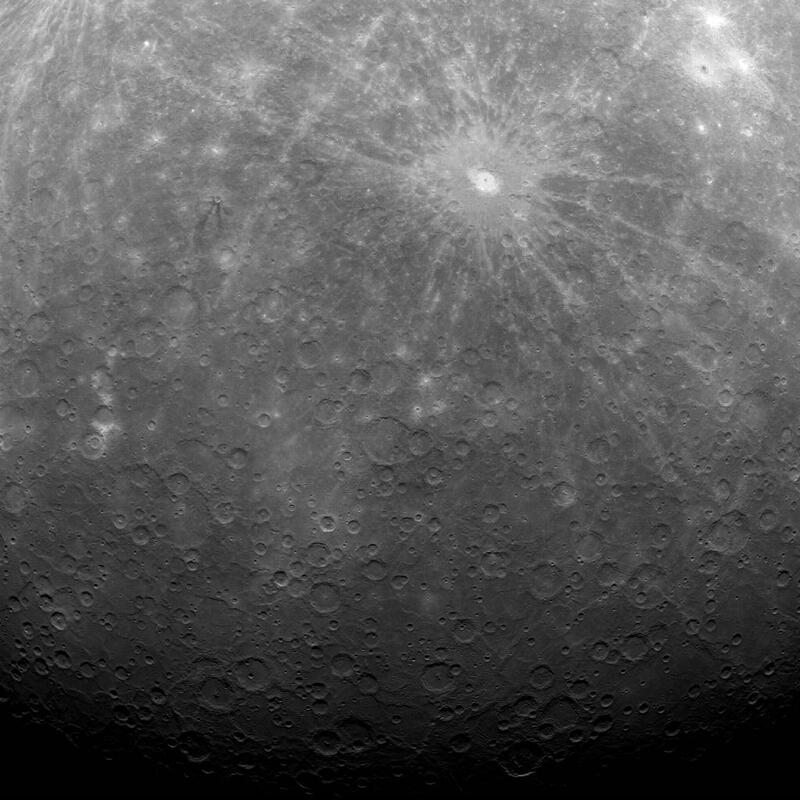 Tomorrow, March 30, at 2 pm EDT, attend the NASA media telecon to view more images from MESSENGER’s first look at Mercury from orbit. Currently, Messenger is the commissioning phase of the mission and is testing out its various equipment and instruments. In a few days, it will begin its year-long primary mission which will answer questions about the formation and composition of the smallest and innermost planet in our solar system. The trails leading from the main crater (Debussy Crater) seem to have flowed from the crater. An indication of lava flow as we see on earth? I’m not sure if it indicates lava flow or perhaps just the path that the ejecta took. Or both!